Retractable aluminium and hypalon rubber handles shown for removable PDS applicator needles (top) and PDA applicator needles (second from top) and budget plastic handles with non removable PDX, PDS and PDA applicator needles (bottom three). Hallprint now specialises in the development of customised anchoring systems for use with pop-up satellite tags. These can also be customised for a range of acoustic and radio tags. There are two basic stainless steel head designs and sizes available, the stainless steel medium darts (SSMD) and the stainless steel large darts (SSLD). A further option preferred by some researchers is the large nylon "umbrella" heads developed by Michael Domeier in the USA. These have the option of being attached to high breaking strain stainless swivels using 7 strand stainless wire or 2.0 mm monofilament crimped at either end. A completely print protected "tether tube" has been developed to cover the tether wire or monofilament. Hallprint's external radio frequency identification (RFID) PIT tags are already providing researchers with much needed peace of mind when tagging fish that could one day become food on the plate. Why expose your organisation to unacceptable risks of expensive litigation by implanting fish with glass capsule PIT tags? Any tagged fish that may enter the human food chain must remain safe to eat. Glass capsule tags are considered too risky to be used as implant tags for obvious reasons, so Hallprint only provide external tags where the PIT tag itself is outside the body of the fish. Hallprint have developed innovative processes that enable glass capsule PIT tags to be moulded into most of our standard external fish tags including (but not limited to) T-Bar tags (types TBF-PIT and TBA-PIT) and plastic tipped dart tags (all except type PDX and PDXL). These tags can also be printed with ID numbers and return information to allow additional recapture information from anglers and commercial fishers and have been successfully used on fishway migration projects and saltwater stock assessment projects already. Hallprint supplies and recommends the Datamars portable GES-3S readers and external wands for use with our external PIT tags. Please contact us for further information and pricing. Wedderburn Marine Scales are specifically designed for use on board fishing vessels and factory trawlers. With an in built motion compensation algorithm, they are able to be used on unstable decks and are the perfect match for Scielex measuring boards when used on board a vessel. Wedderburn Marine Scales are both equipped with motion compensation devices which compensate for the motion of a vessel at sea, making weighing almost as fast and accurate as on land. 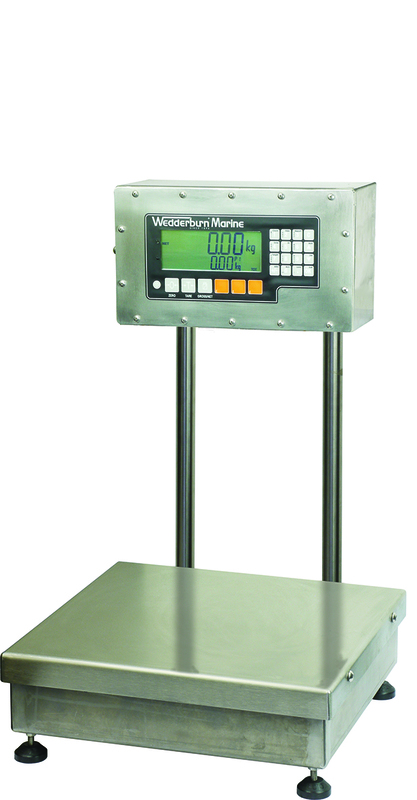 Wedderburn have developed an Australian-made marine weighing scale specifically for the Australian Marine Industry. Their on-board motion compensated marine scales incorporate motion and tilt compensation for weighing at sea, and due to Wedderburn’s Marine Motion Compensated Software, you’ll no longer need to calibrate your marine scales whilst out at sea. The Wedderburn on-board motion compensated marine scale is being used by commercial fisherman and marine researchers throughout Australia enhancing efficiencies in South Australia, San Remo, Tin Can Bay, Portland, Tasmania, Queensland, Darwin, Fremantle, Point Samson, Bundaberg, Townsville, Eden, Lakes Entrance, Jakarta, Georgia (USA), South Carolina (USA), Florida (USA). Click to find further details of the Wedderburn scales. Hallprint is now a global supplier of A&D brand weight scales to the fisheries market. These are fully waterproof (IP67 rated) and excellent value for money. We can offer you a package to suit your needs from scales with a 3200g capacity at 0.01g accuracy to a 30kg capacity scale with 1g accuracy. These scales are perfectly matched for use with the Bioscribe electronic measuring board which when connected has drivers to acquire data directly from them through a hotkey on the decal. We work closely with each customer to ensure the best suited product combination for their requirements. A&D scales are backed by a 5 year warranty on selected models. Please contact us for more information and pricing on A&D scale options or perhaps a tailored package deal to include a Bioscribe measuring board.